This is the first complete, one-volume English translation of the ancient Chinese text Xunzi, one of the most extensive, sophisticated, and elegant works in the tradition of Confucian thought. Through essays, poetry, dialogues, and anecdotes, the Xunzi presents a more systematic vision of the Confucian ideal than the fragmented sayings of Confucius and Mencius, articulating a Confucian perspective on ethics, politics, warfare, language, psychology, human nature, ritual, and music, among other topics. 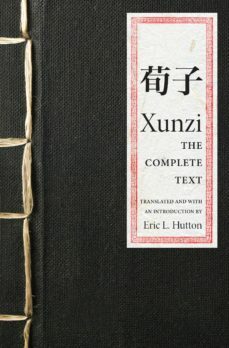 Aimed at general readers and students of Chinese thought, Eric Huttons translation makes the full text of this important work more accessible in English than ever before.Named for its purported author, the Xunzi (literally, "Master Xun") has long been neglected compared to works such as the Analects of Confucius and the Mencius. Yet interest in the Xunzi has grown in recent decades, and the text presents a much more systematic vision of the Confucian ideal than the fragmented sayings of Confucius and Mencius. In one famous, explicit contrast to them, the Xunzi argues that human nature is bad. However, it also allows that people can become good through rituals and institutions established by earlier sages. Indeed, the main purpose of the Xunzi is to urge people to become as good as possible, both for their own sakes and for the sake of peace and order in the world.In this edition, key terms are consistently translated to aid understanding and line numbers are provided for easy reference. Other features include a concise introduction, a timeline of early Chinese history, a list of important names and terms, cross-references, brief explanatory notes, a bibliography, and an index.